At INISHFREE we are aware of the importance of wearing the correct size of Irish Dancing Shoes - nothing is worse than an ill fitting shoe as the norm favours a neat and snug fit. This is paramount to the dancer and more importantly the adjudicators! 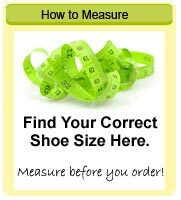 If you don't know your USA or UK shoe size please use the chart below with the measurement guidelines. If you are unsure of the shoe size you require, we recommend that you draw around your foot on a plain piece of paper and measure between its two longest points (heel to big toe) in centimetres. Place the foot on a blank piece of paper and draw around it, ensuring the pen/pencil is held vertically. 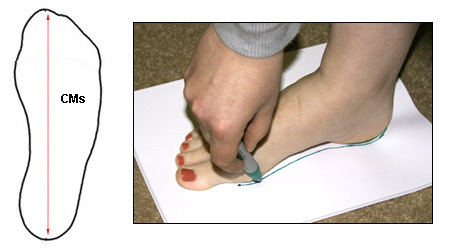 Draw a line along the foot from the heel to the toe edge and measure. Clearly mark the length of the foot in centimetres. Our hard shoes are made to a standard UK width and correspond to your regular dress shoe size. Note: A half size will normally give an extra bit of width to the foot. Note: Hard shoes are generally worn nice and snug at the start allowing for possible stretching of the leather. Our soft pomps are designed to fit to your regular shoe size. For a tighter and more professional fit most dancers go down a full shoe size. The Aoife pomp is made on a last a size smaller than normal to give it its unique arch and wonderful fit. 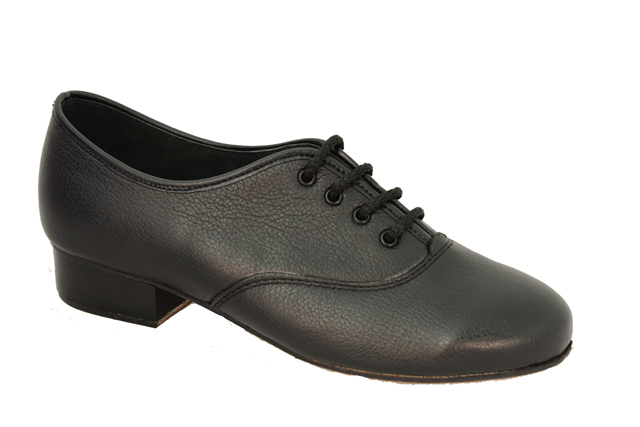 For a tighter fit most dancers will go down one to two sizes on our Aoife pomp. This is a personal choice about how tight you want the fit but do bear in mind that the leather will stretch slightly. The Aoife patent pomp has a more firm feel and will fit a size smaller than your regular shoe size.